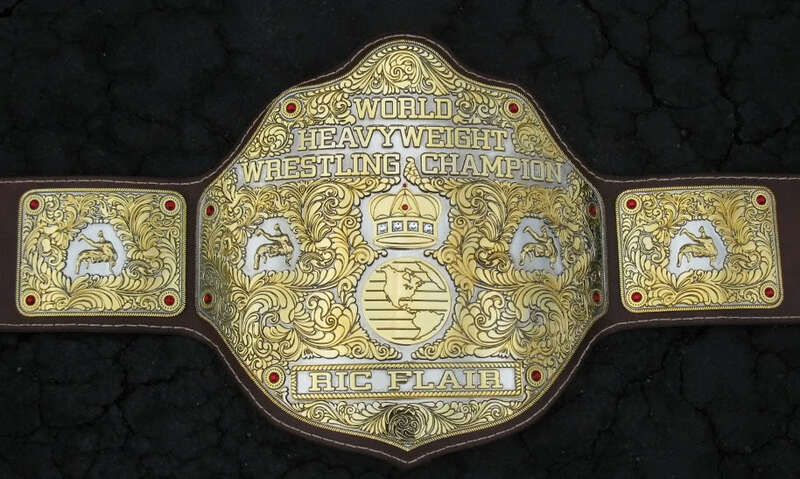 Today I'm talking about some of my favorite championship belt designs in wrestling lore. For decades the WWF generally seemed to have the most eye-catching belt configurations, but in recent years other companies have somewhat surged ahead in this area. With the advent of the Universal Title it became clear WWE was endeavoring to make all their belts look the same, a la UFC. To me that's both uncreative and bad business - if you're trying to sell loads of belt replicas wouldn't you want each one to look unique? A great-looking belt design can add a sense of grandeur to a title, helping elevate it beyond simply being a prop, to being one of the richest prizes in the game and a symbol of excellence. Of course a lot of that also depends on who wears the strap, but a championship belt needs to look like something for which every wrestler would be willing to risk it all. 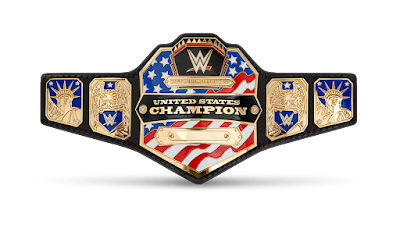 Probably the least conventional of the designs on this list, the WWE version of the US Title uses the American flag as the center plate background, with images of the Statue of Liberty on the side plates. While the NWA and WCW versions of the belt sported understated stars and stripes imagery, the WWE version just took it one step further, conveying literally the idea of a United States Champion. For years this was the best-designed belt in the WWF. When the "Winged Eagle" belt was adopted in 1988, the Intercontinental Title became physically the largest belt in the company, and for a long time this was the top belt for the in-ring workhorses. It displayed a simple, blocky design (which was borrowed by both WCW and ECW for some of their belts) with the side plates all carrying the company logo behind the image of two wrestlers grappling. This design was so successful the company went back to it in 2011, after the rather bland Attitude Era design was discontinued. It's kinda sad the best-looking current WWE Championship is the one recycled from the 80s. I had to cheat here and include a tie. The current and former Ring of Honor belt designs are both incredibly ornate and gorgeous to look at. The previous one boasted leaves climbing up the sides in incredible detail, bringing to mind Roman gladitorial games, while the new version smacks of kingly tradition, with its paisley flourishes adorning a stylized crown above the nameplate. These are both beautiful belts. TNA was clearly influenced by the IWGP design when they made this belt, using a similar font, a silver and gold pallette, and groupings of four grommets between the plates. The result was a belt that screamed "state of the art." One of my favorite touches with this belt was the arches at the top, which just struck me as a very creative, unusual flourish. Sadly this belt was either very cheaply made or wasn't taken care of; those arches snapped off the plate only months after the belt's unveiling, and several grommets went missing. A pretty shabby way to treat your company's top title if you ask me. This would be replaced in 2011 with a simpler, UFC-inspired design. Hulk Hogan's 1986 World Title was the active belt when I first started watching wrestling all those years ago, and it still holds sentimental value for me. 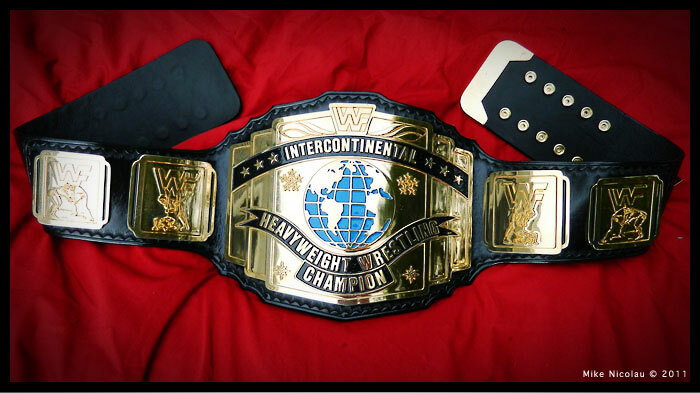 The company only kept the design for two years, which I find baffling, and it was replaced by the ever-popular "Winged Eagle," but for me this version is superior, with its silver and gold background peppered with the colorful world flags on the side plates. At the time I remember thinking how clever that touch was. "Of course, all the flags, because it's the WORLD Title." The belt that helped define the Attitude Era, this design combined the classic "Winged Eagle" belt that had been in place for a full decade (a design I've never liked as much as most people) with the huge early 80s round belt held by Bob Backlund and Hulk Hogan. Where the "Winged Eagle" belt was quite diminutive, the "Big Eagle" design had real weight to it and looked befitting of the company's top championship. Steve Austin was the first to wear this design but it was later tweaked with the new scratch logo and a black strap instead of a blue one. This belt was simple but tremendously effective. Perhaps no current design is as resplendent as New Japan's top championship. 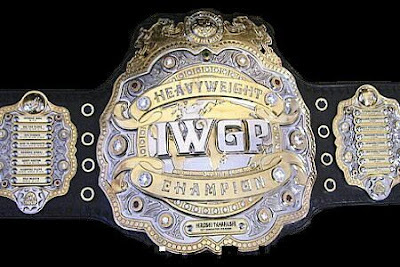 Sporting the IWGP (International Wrestling Grand Prix - the fictitious governing body of NJPW) logo in front of a stylized globe, roughly a dozen jewels adorning the center plate, and dueling lions across the top, the detail work on this belt is stunning. I also like the added touch of including side nameplates for each of the former champions, drawing attention to New Japan's rich history. The current physical belt is in horribly tatty shape and should be replaced immediately, but the design itself is one of my favorites. Ring of Honor clearly uses a quality belt designer, as this is their third inclusion on this list. Being a big fan of art deco, I absolutely love the 2009 version of the Ring of Honor Title. They took the frequently used "eagle" motif and gave it an industrial edge, making the eagle's wings look like steel blades, adding a classic art deco font across the front, and various national flags on the side plates. This all lent the belt a very worldly, modernist aura. How this design was only used for three years is beyond me. WWE originally replaced their dual World Titles with this design in 2002 but there was a slight problem - the belt was tiny. The first three men to wear this belt were the 6'4" Triple H, the 6'5" Hulk Hogan, and the 6'10" Undertaker, which only accentuated how underwhelming it looked. Fortunately during Taker's reign they commissioned a larger version, which remained in use until 2005 and was worn by Brock Lesnar and Kurt Angle, among others. This design was both classic-looking, with its shield side plates (bearing the McMahon family crest), and modern, with its shooting stars crossing the center plate. Despite being decommissioned over a decade ago, this belt still epitomizes for me the modern WWE era. It's the yardstick by which all other championship belt designs are measured. 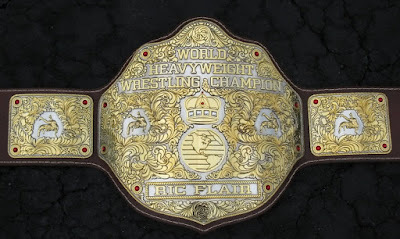 Originally created for Ric Flair in 1986, the Big Gold Belt was intended to convey the pageantry and splendor of the "Nature Boy's" Championship reign. Bedecked with red jewels and swirling textures, the enormous center plate design has long been a favorite of wrestling fans everywhere and was reused by WWE in 2002 (complete with the company logo added at the top). This is a truly timeless championship belt, and remains my favorite of all time. Did I miss any of your favorite designs? Comment below, and thanks for reading! 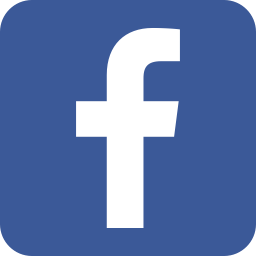 Don't forget to follow us on Facebook, Google+ and Twitter (@EnuffaDotcom)!